It’s taken two years of design but Ben from Crimson Guitars and extended range bassist 05Ric have collaborated to produce the extraordinary bass guitar you see here. Its beautifully minimalist appearance aside, the instrument contains several interesting features and design choices. The main motivations for the Klein inspired design are ergonomics, ease of playability and comfort so for starters, the guitar body is made from light weight cedar with a maple cap. Another important factor is balance and the design addresses this in several ways. First, the headstock’s mass has been reduced and combined with lightweight Sperzel tuners. I was curious about the choice of a headstock over a headless design but Ben found that the combination “negated any issues with neck-drop.” Second, note how the neck through design extends below the body. Combined with the bridge placement, it acts as a counterbalance to the headstock. Third, the multi-laminate neck actually contains two tone chambers running down its length reducing mass and improving balance. 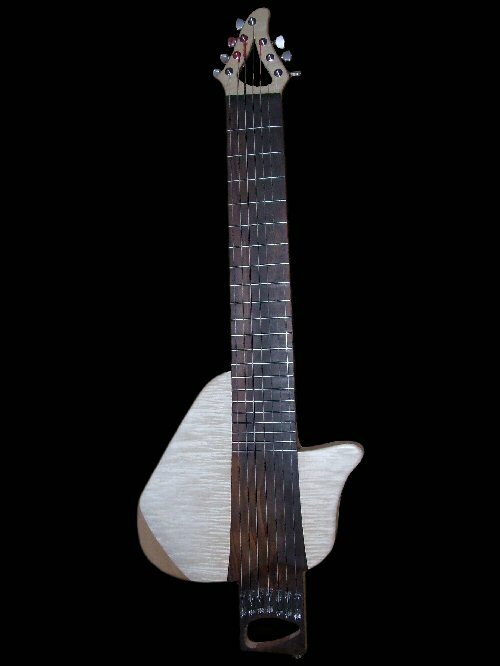 Designed to address 05Ric’s unique playing style, the instrument incorporates aspects of the Chapman Stick and a conventional electric guitar. 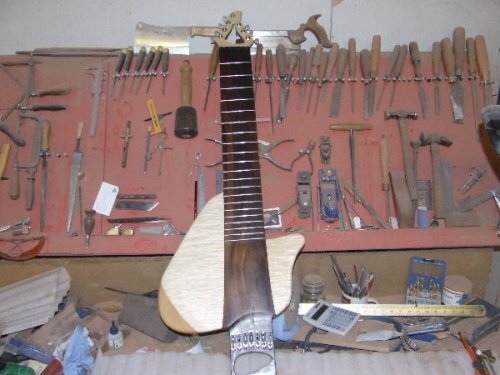 The bass side of the guitar is played with a tapping technique and so was built with a flat fingerboard. Move over to the guitar side of the neck and you’ll find a 12.5″ camber to facilitate playing in a more conventional fashion. You might be wondering – “Where is the pickup?” It’s there but its hidden. A custom pickup with very powerful magnets picks up string vibration despite the 8mm of solid rosewood and the 10mm of air between it and the strings. I had to note this because I thought it was quite extraordinary. 05Ric worked out the design over the course of two years and then Ben from Crimson Guitars executed the build in about a week! You just don’t see that speed of execution on even basic designs let alone a guitar as unique as this. Ric fell in love with her before I even put the pickup in and once she was ‘alive’ he went and re-recorded most of the guitar/bass parts in his upcoming album with Gavin Harrison.. this was done one week before the album was supposed to go for its final mix!! Finally, thanks to Crimson Guitars’ generosity, I’ll have several follow up articles showing progress pics for the 05Ric Signature Model ERB. I follow Ben’s Crimson Guitars workshop diary regularly and am always amazed at the sheer quantity of work he gets through. He doesn’t hang about, but he doesn’t let this compromise his guitar builds. Absolutely fantastic stuff. Fans of ergonomic design will also appreciate the carving he does on most of his designs. I’m pretty amazed as well, GL. Beautiful work and fast work are hard to find in one package. I love it! The only, *ONLY* thing I would have changed on it would be for the bridge end extension to have been somehow sculpted to compliment the rest of the instruments curves. But that’s just aesthetics. One thing I keep wondering in many of these presentations where the guy is standing is the ergonomic aspect isn’t being showcased. Unfortunately steph, it’s not always possible to showcase the sitting position since images or videos aren’t always available. However, there’s more to come on this particular instrument so stay tuned. Thanks so much, Ray! Not sure how I missed that one! I have a few questions for the builder, if you don’t mind. WHat is the scale length of the ERB? What string diameters did you use? Lastly, what key/note is the thickest string tuned to? Thanks. Hey John: Here you go! Lowest string is tuned to “c” and is 95 in diameter.